With the new year upon us, it’s time to make some changes in the office. It starts with that crazy rumor flying around that Mike in accounting starting dating Kendall in HR at the corporate retreat. Yes, 2017 is your chance to end your office’s continual cycle of passing around tasty little morsels of hijinks and hearsay. There are obvious reasons you need to bring an end to the rumor mill: employee morale will suffer, co-workers will build insurmountable rifts and, in some cases, reputations will be ruined. Navigating those scenarios can be tough, though. That’s why we’ve researched to come up with a guide for handling office gossip that will help you curb strained or broken relationships and head into the rest of the year with some much-needed peace. What if you overhear a conversation you didn’t want to hear? What if the rumor floating around involves you? What if people are looking to you to kill the rumor? In each of these scenarios, circumstances demand that you take action, regardless of your disposition. You may want to crawl back in your office and crunch numbers or make calls, but you’ve got to act. Ignoring the rumors does a few things to you and your employees’ psyche. When you choose not to confront the situation when you first hear of it, there’s a good chance you’ll be less likely to confront it in the future when it is once more brought to your attention. When your employees observe this passivity happening, they’ll lose faith in your ability to resolve relational problems and be left wondering where the solution will come from. In both cases, nobody feels comfortable. So, let’s say one of your supervisors comes to you and says there’s a vicious little rumor floating around that Mike and Kendall started dating at the company retreat. Everyone knows that dating isn’t prohibited, but they also know it’s not the best choice. The goal here isn’t to accuse, because there’s nothing that shuts down or prolongs a confrontation quicker than people getting defensive. Give the benefit of the doubt, but don’t patronize. Your workplace is made up of adults, and though the office doesn’t always act on-point, they have the ability to deal with truth and move on. 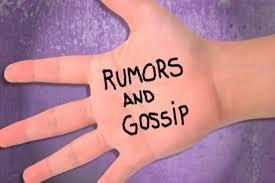 Relationships aren’t the only classic rumor topics. Promotions, hirings and firings tend to be fertile ground for half-truths and jealousy. So, rather than make moves in secret – they won’t be secret for long – institute a policy of transparency. If there are changes being made, let your staff know. Be the first to break the news about personnel changes and you’ll find that many of the rumors that would normally pop up aren’t there anymore. Think about it from your employees’ perspective. They see you take someone into an office, and then a few minutes later that person comes out of the office with a dejected look on their face and doesn’t return to their desk. That kind of scenario is like a neon marquee flashing all kinds of possibilities that your office will debate for days to come. Did You Hear that the Boss Is Trying to End Office Gossip? We’re not going to deceive ourselves into thinking all office gossip can be solved by the three tips we gave in this article. Office rumors often involve relationships and politics, and those two arenas are not black and white. However, you can set a precedent of honesty and quick action if you decide not to ignore gossip, confront it directly and announce changes early. If rumors involve actions or situations that directly conflict with company policy, consult your human resources department.